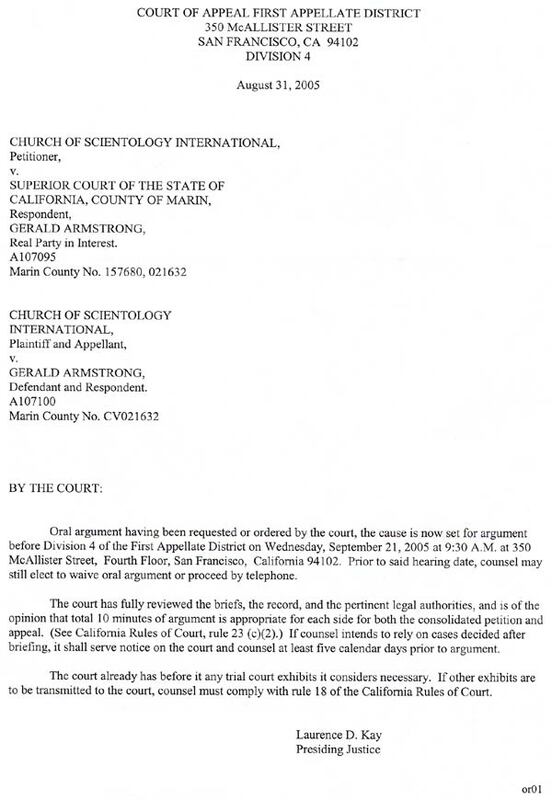 Oral argument having been requested or ordered by the court, the cause is now set for argument before Division 4 of the First Appellate District on Wednesday, September 21, 2005 at 9:30 A.M. at 350 McAllister Street, Fourth Floor, San Francisco, California 94102. Prior to said hearing date, counsel may still elect to waive oral argument or proceed by telephone. The court has fully reviewed the briefs, the record, and the pertinent legal authorities, and is of the opinion that total 10 minutes of argument is appropriate for each side for both the consolidated petition and appeal. (See California Rules of Court, rule 23 (c)(2).) If counsel intends to rely on cases decided after briefing, it shall serve notice on the court and counsel at least five calendar days prior to argument. The court already has before it any trial court exhibits it considers necessary. If other exhibits are to be transmitted to the court, counsel must comply with rule 18 of the California Rules of Court.